Switch things up tonight and enjoy breakfast for dinner. That's right — we want you to put on your apron and scramble some eggs. Use those eggs in these breakfast burritos with crispy skillet potatoes and you'll be wondering why you don't always eat breakfast at night. There is something special about breakfast for dinner. We're not exactly sure what it is, but we do know that these breakfast burritos with crispy skillet potatoes are no exception. Stuffed full of your favorite fixings, these burritos are a utensil-free meal the whole family will enjoy! Coat the bottom of a cast iron skillet with vegetable oil and turn the heat on to medium high. Once the oil is hot, add the diced potatoes and spices. Stir to combine and cover the skillet with a lid. Cook for 10 to 15 minutes, stirring occasionally. The potatoes will be done when soft on the inside and crispy on the outside. Remove from heat. Drizzle some vegetable oil into the bottom of a skillet and turn the heat on to medium. Whisk the eggs in a small bowl and add to the skillet once the pan is warm. Scramble the eggs until they are cooked through. Remove from heat. Warm the tortillas, fill them with the skillet potatoes, scrambled eggs and toppings of your choice. 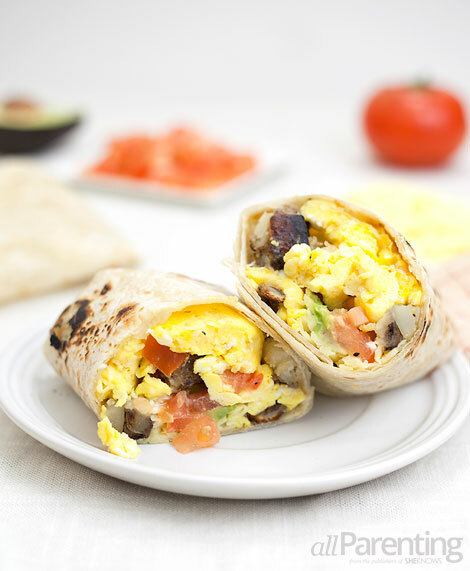 Wrap the tortilla up tight and enjoy your breakfast for dinner!